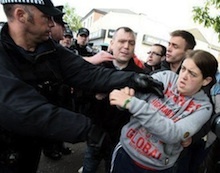 The route through nationalist north Belfast had been forcibly cleared by the PSNI, who beat and shoved residents away from the parade route before the first march took place in the morning. The parade through the Catholic Ardoyne area was one of hundreds held on Thursday by the Protestant Orange Order to mark a 17th century Protestant battle victory over Catholics. Serious trouble broke out immediately after the ‘return’ parade passed at around 4.30pm. One vehicle was burned out and some petrol bombs thrown. An unknown number of plastic bullets were fired by the PSNI police while water cannon was also used as clashes broke out. Members of local residents group, the Greater Ardoyne Residents Collective (GARC) appealed for calm, and rioting ebbed briefly as a pre-planned protest by GARC then took place along the same road which the Orangemen had just marched down. However, loyalists (including some known paramilitaries) who had gathered just meters away immediately rioted and violently attacked the GARC protest. As events deteriorated, fireworks, petrol bombs, stones, bricks and bottles were hurled at police lines, while a second blazing car was driven up to create a second barricade. At one point, armoured PSNI vehicles were driven at speed through the streets in an apparent attempt to clear the area. A blast bomb was thrown at the PSNI vehicles, while one protestor was reported to have suffered a severe beating at the hands of the police. Serious disturbances continued in the Brompton Park area of north Belfast late into the night. The PSNI confirmed reports of at least ten gunshots as trouble intensifed, but said there were no injuries. Trouble also broke out in other areas. Disturbances in Craigavon saw a bus set ablaze. In the Bogside area of Derry, rioting continued into the early hours of the morning with at least one car burned out, while petrol bombs and stones were thrown at the PSNI. There were reports that the home of the new Sinn Féin Mayor of Derry, Kevin Campbell, was among those raided by the PSNI overnight. Expectations of violence had increased during the week following criticism by unionist leaders over the conditions placed on the Orange parade in Ardoyne. In particular, they vehemently opposed a decision by the Parades Commission, which adjudicates on the route of contentious parades in the North, to have the ‘return parade’ completed by 4pm. Orange lodges from across Belfast typically march to and from a large central gathering known as ‘the field’ every 12th of July, the anniversary of the Battle of the Boyne. Almost all of the trouble in recent years has stemmed from the return evening journeys, when tension is typically higher. This year, the decision to bus the Orangemen into nationalist north Belfast to march the return route exacerbated and increased the provocation for residents. Sinn Féin’s Gerry Adams said he agreed with loyalist leader Jackie McDonald that the Orange Order need to “look seriously” at the issue of return parades. Mr Adams said a decision not to return past Ardoyne would have “transformed” the situation in North Belfast and would not have prevented the Orangemen and loyalists “participating in and enjoying their celebrations”. He also called on the Orange Order to enter into dialogue with local residents. “There has been much good work done in North Belfast on the parading issue in recent years. This work needs supported not undermined,” he said. “However the Orange Order needs to step forward and make their contribution to the peace process. “Genuine dialogue is the only way to resolve this issue. Recently we saw positive examples of that with the Orange leadership addressing the Seanad in the Oireachtas for the first time and Martin McGuinness meeting Queen Elizabeth II. In a statement, GARC praised their members and supporters for conducting themselves with dignity and respect in their protest. The group strongly condemned the PSNI’s actions. “They attacked residents returning to their homes in the morning, failed to protect residents in the immediate aftermath of the Orange Order return parade from attack by loyalists, tried to ensure a stand off situation would develop into violence on two separate occasions.. and totally failed to protect GARC marchers from loyalist paramilitary attacks on the Crumlin Road. “They had previously stated that they would ‘robustly enforce’ the Parades Commission’s 12th determinations, and ensure marchers and protestors would be fully protected. “What today has demonstrated is that while they robustly defended the Orange Order marches, they were more than willing to see the people of Ardoyne and their supporters attacked.